I've been watching a mini Teresa Wright film festival lately. Teresa Wright played Laura Roberts in Somewhere in Time, companion to the elder Elise. 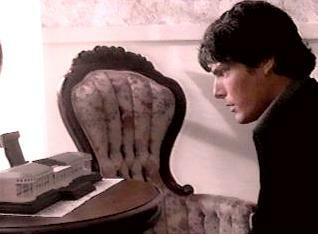 She has a touching scene with Chris Reeve, who reveals the pocket watch. Laura shows him some artifacts, including the music box shaped like the Grand Hotel that plays the Rhapsody; also the "Travels through Time" book. I didn't know much about her. Turns out she was a huge star in the 1940s. She famously is the only person to be Oscar-nominated for her first three roles. I recently watched "The Best Years of Our Lives" (1946, won for best supporting actress), "Mrs. Miniver" (1942), and Hitchcock's favorite "Shadow of a Doubt" (1943). The latter was fascinating; she even got TOP billing, over Joseph Cotten and the title. In "Shadow", she very convincingly goes from bored and naive to suspicious and worldly. A natural and lovely talent who was discovered for films by Samuel Goldwyn, the always likable Teresa Wright distinguished herself early on in high-caliber, Oscar-worthy form -- the only performer ever to be nominated for Oscars for her first three films. Always true to herself, she was able to earn Hollywood stardom on her own unglamorized terms. Born Muriel Teresa Wright in the Harlem district of New York City on October 27, 1918, her parents divorced when she was quite young and she lived with various relatives in New York and New Jersey. An uncle of hers was a stage actor. She attended the exclusive Rosehaven School in Tenafly, New Jersey. The acting bug revealed itself when she saw the legendary Helen Hayes perform in a production of "Victoria Regina." After performing in school plays and graduating from Columbia High School in Maplewood, New Jersey, she made the decision to pursue acting professionally. Apprenticing at the Wharf Theatre in Provincetown, Massachusetts during the summers of 1937 and 1938 in such plays as "The Vinegar Tree" and "Susan and God", she moved to New York and changed her name to Teresa after she discovered there was already a Muriel Wright in Actors Equity. Her first New York play was Thornton Wilder's "Our Town" wherein she played a small part but also understudied the lead ingénue role of Emily. She eventually replaced Martha Scott in the lead after the actress was escorted to Hollywood to make pictures and recreate the Emily role on film. It was during her year-long run in "Life with Father" that Teresa was seen by Goldwyn talent scouts, was tested, and ultimately won the coveted role of Alexandra in the film The Little Foxes (1941). She also accepted an MGM starlet contract on the condition that she not be forced to endure cheesecake publicity or photos for any type of promotion and could return to the theater at least once a year. Oscar-nominated for her work alongside fellow cast members Bette Davis (as calculating mother Regina) and Patricia Collinge (recreating her scene-stealing Broadway role as the flighty, dipsomaniac Aunt Birdie), Teresa's star rose even higher with her next pictures. Playing the good-hearted roles of the granddaughter in the war-era tearjerker Mrs. Miniver (1942) and baseball icon Lou Gehrig's altruistic wife in The Pride of the Yankees (1942) opposite Gary Cooper, the pretty newcomer won both "Best Supporting Actress" and "Best Actress" nods respectively in the same year, ultimately taking home the supporting trophy. Teresa's fourth huge picture in a row was Alfred Hitchcock's psychological thriller Shadow of a Doubt (1943) and she even received top-billing over established star Joseph Cotten who played a murdering uncle to her suspecting niece. Wed to screenwriter Niven Busch in 1942, she had a slip with her fifth picture Casanova Brown (1944) but bounced right back as part of the ensemble cast in the "Best Picture" of the year The Best Years of Our Lives (1946) portraying the assuaging daughter of Fredric March and Myrna Loy who falls in love with damaged soldier-turned-civilian Dana Andrews. With that film, however, her MGM contract ended. Remarkably, she made only one movie for the studio ("Mrs. Miniver") during all that time. The rest were all loanouts. As a freelancing agent, the quality of her films began to dramatically decline. Pictures such as Enchantment (1948), Something to Live For (1952), California Conquest (1952), Count the Hours (1953), Track of the Cat (1954) and Escapade in Japan (1957) pretty much came and went. For her screenwriter husband she appeared in the above-average western thriller Pursued (1947) and crime drama The Capture (1950). Her most inspired films of that post-war era were The Men (1950) opposite film newcomer Marlon Brando and the lowbudgeted but intriguing The Search for Bridey Murphy (1956) which chronicled the fascinating story of an American housewife who claimed she lived a previous life. The "Golden Age" of TV was her salvation during these lean film years in which she appeared in fine form in a number of dramatic showcases. She recreated for TV the perennial holiday classic The 20th Century-Fox Hour: The Miracle on 34th Street (1955) in which she played the Maureen O'Hara role opposite Macdonald Carey and Thomas Mitchell. Divorced from Busch, the father of her two children, in 1952, Teresa made a concentrated effort to return to the stage and found consistency in such plays as "Salt of the Earth" (1952), "Bell, Book and Candle" (1953), "The Country Girl" (1953), "The Heiress" (1954), "The Rainmaker" (1955) and "The Dark at the Top of the Stairs" (1957) opposite Pat Hingle, in which she made a successful Broadway return. Marrying renowned playwright Robert Anderson in 1959, stage and TV continued to be her primary focuses, notably appearing under the theater lights in her husband's emotive drama "I Never Sang for My Father" in 1968. The couple lived on a farm in upstate New York until their divorce in 1978. By this time a mature actress now in her 50s, challenging stage work came in the form of "The Effect of Gamma Rays on Man-in-the Moon Marigolds", "Long Day's Journey Into Night", "Morning's at Seven" and "Ah, Wilderness!" Teresa also graced the stage alongside George C. Scott's Willy Loman (as wife Linda) in an acclaimed presentation of "Death of a Salesman" in 1975, and appeared opposite Scott again in her very last play, "On Borrowed Time" (1991). After almost a decade away from films, she came back to play the touching role of an elderly landlady opposite Matt Damon in her last picture, John Grisham's The Rainmaker (1997). Teresa passed away of a heart attack in 2005. TRivia:-In honor of her heartfelt performance in The Pride of the Yankees (1942), when Teresa Wright died in 2005, when the roll call of former Yankees who had passed on was announced, her name was read out among all the ballplayers. As mentioned earlier, the fans of SIT gather at Mackinac Island every October at the Grand Hotel. Apparently, some of the stars occasionally show up. For the 20th anniversary in 2000, Teresa Wright, Jane Seymour and post-accident Chris Reeve all showed up. How thrilling that must have been! Sadly, so many of the cast have died. Jane Seymour and Christopher Plummer are the only major players alive. Happy 102nd Anniversary to Elise and Richard! You know, I don't think I've ever seen this movie. Chuck, I recommend it. It's a bit melodramatic and simple but a great entanglement... and bring some tissues...I still remember seeing it theaters when it first opened and was completely overwhelmed. It kicked me really hard, enough to locate the book it was based on and this was way before the internet. But, it is a love story with two major screen stars at the top of their games, hence, not for everyone. V.
Re-reading this thread I got some good ideas for a mini-film festival during the coming snow storm! I want to see "Shadow of a Doubt" and "Somewhere in Time" for sure...join me? You got one coming in from the Pacific? You should see The Little Foxes, too. Happy 104th Anniversary to Elise and Richard!